Kalloni (Greek: Καλλονή, Turkish: Kalonya) is a town and a former municipality on the island of Lesbos, North Aegean, Greece. Since the 2011 local government reform it is part of the municipality Lesbos, of which it is a municipal unit. 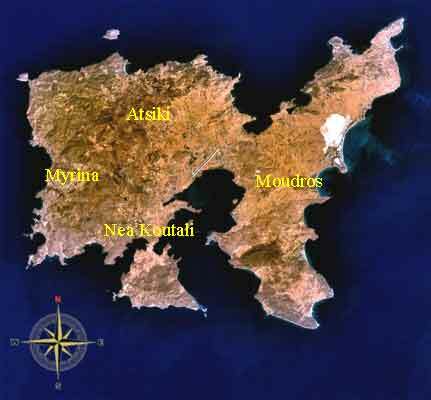 It lies in the west-central part of Lesbos. It has a land area of 241.946 km². At the 2001 census it had a population of 8,194 inhabitants. The municipal seat was the town of Kalloní (pop. 1,732). Its largest other towns are Ágra (990), Parákoila (926), Dáfia (851), Fília (636), Skalochóri (581), Anemótia (534), and Kerámi (524). It was known "Kalonya" during Ottoman rule and was a nahiya (township) center at Molova kaza of Midilli sanjak in Cezair-i Bahri Sefid Vilayet (Mediterranean Islands Province in Ottoman Turkish) before joining to Greece in 1912. Kalloni is a beautiful natural spot, since it is surrounded by the gulf waters, and supplied by the rich plain of 100 km², through which six rivers flow. There is always enough water from the underground and spring waters for its vineyards and gardens, and surrounded by historic monasteries. Kalloni was always the crossroad where the main roads passed. This has not changed much from ancient times. In the last decade, this large village has developed in the field of trade and is the seat of the municipality that comprises the settlements of Agra, Anemotia, Dafia. The summer festivals present a special interest. The festival of sardine in Skala Kalloni in July, where the taste of freshly grilled sardines are offered to the visitors with plenty of ouzo accompanied with live Greek traditional music and dance shows. Also, in the 16th August a huge fest takes place in the main square of Kalloni in order to honor the ones that immigrated to other countries. The livestock breeding in Agra, the wine festival in Anemotia as well as the panigyri of Saint Trinity on the 7th of July in Kalloni, which includes three days feast and horse races. There are significant archaeological sites on the plain. The ancient Lesbians worshiped many of the ancient gods in great sanctuaries, parts of which are preserved today. The temple of Messa was dedicated to Zeus, Dionysus and Ira, constituted a worship and communication centre for all the Lesbians, and at the beginning of the 2nd century B.C. was the seat of the federation of all the cities of Lesbos. During the early Christian period a basilica was erected over the temple, which was succeeded by a mid-Byzantine church. There are many remains, ruins, altars and ancient remnants around the region, signs of worship of the Lesbian people who arrived there as pilgrims to the great sanctuary of Pyrra and of the entire island. Important archaeological sites are also found in Apothika, between Parakila and Agra, where the ancient retaining wall of about six meters height is located, but also in Makara, bearing the name of the first settler of Lesbos during ancient times. The lagoon and bay of Kalloni is a shallow, rich wetland that hosts a stupendous variety of aquatic and avian life, including flamingos, porpoises and seals. It is especially renowned for its yield of sardine fishing. Following his departure from Plato's Academy after being passed over for the school's headship, Aristotle spent a few years with his friend, Theophrastus, at the Kalloni lagoon, studying animal life: his observations there formed the material for the very first treatises ever written on the subject of biology, namely his books on the "history, parts, movement, progression, and generation" of animals.